EASY OPEN LATCH: Our dog or baby gate was designed with the user in mind. With a quick release, one-handed latch to open the gate easily, there is no need to struggle to open your animal barrier when your hands are full. 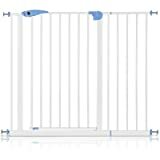 EXTRA WIDE: Dog fences can sometimes be too short for your needs, the Primetime Petz Safety indoor gate spans an adjustable length of 24.5” to 41”, making use in extra wide hallways or stairways possible. DOUBLE LOCK SYSTEM: Keep your toddlers or child from getting through the gate. With a lock that is just complex and high enough so you can rest easy knowing your little one won’t be getting out! GREAT FOR ALL SIZED BREEDS & PETS: Whether you have a large, medium, or small cat or dog, our gate will ensure no jumping or pushing through. Block off areas you want to keep animals out of! 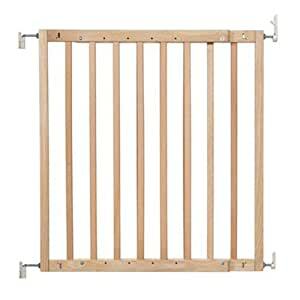 5.0 out of 5 starsBest pet gate - ever!! This gate is exactly what I needed and was searching for! The best feature of this gate - the design! The gate has no bottom rail that remains in place at the bottom when the gate opens. This gate design eliminates the trip hazard hat most other gates have due to a poor design. In my view, this gate is safe, sturdy, and very user friendly! I love it!! Pros: I like the look, I like that there is no threshold to clear. Cons: the latch is a bit tricky, you kinda have to lift the gate and set it into the sockets instead of just push, close. The instructions are atrociously badly written. You have to guess what the heck they are talking about and it's pretty counter intuitive. Horrible directions. Very difficult to understand how to assemble it. No words ,just pictures of the many separate parts it comes in. Good gate once you rip your hair out trying to put it together.